With Halloween coming in a wee-little-bit over a week from today, so I want to send your way some appropriate music to celebrate the occasion by way of Sumthing Else Music. Why them, you ask? Well, I figured that you wanted to get into the holiday/celebratory spirit with newly-released digital soundtracks from some of the two recent Silent Hill games, including Silent Hill: Downpour (for the PS3 and Xbox 360) and Silent Hill: Book of Memories (for the PS Vita). 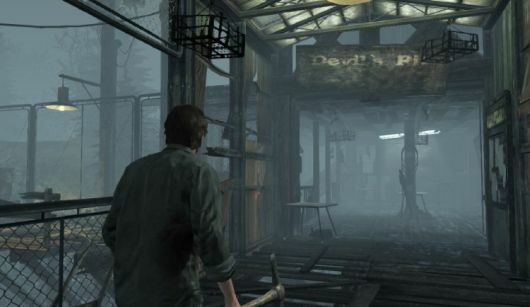 One of the things that really assisted in the thrills, scares, and jump-out-of-your-seat moments in the Silent Hill games was the music, which used Akira Yamaoka’s creepy, clashing chords from the series’ start up until the release of Silent Hill: Homecoming, the first Western-developed game in the series. Daniel Licht would compose the scores for both Downpour and Book of Memories, as well as last year’s Dishonored, as well as the Showtime television show, Dexter. Just from that, you can tell that the spookiness and creepiness is strong with Mr. Licht. Well, since I’m looking forward to wetting my pants in fear later tonight, I think I’ll pop in Silent Hill 2 on my OG Xbox (since I can’t call it the Xbox One anymore) for some awesome and memorable scares. Now, if only I had access to that absurd Rock band fog machine since the game should be enough to supply the nightmares…. Next Next post: Remember When ‘Hacksaw’ Jim Duggan was the WCW U.S. Champion?